I absolutely love shopping. In fact, I once was a compulsive shopper until I was swept over the dam with credit card debt. Shopping, especially for non-food items can become habitual and even addicting. As for some, it can go way too far, even posing as a severe financial endangerment to those who can’t control themselves. Although, not every compulsive shopper is exactly the same, there are common modes of thinking that bring on this habit. Having been one myself, I have written this post to bring its readers deep into the ecstatic world of the compulsive shopper, the way I see it anyway. As the expression goes: “It takes one to know one” and I was one (and deep down still am)….so I should know. Just a head’s up, this post is rather long but well sectioned off. Therefore, you are free to read the whole thing or just the parts that interest you. The real truth is….shopping doesn’t really change our lives at all. In fact, it may make our lives worse, especially if we go deeply into debt. Those with the strong urge to shop compulsively refuse to see the financial damage it can do to us, especially if we must use credit cards to support this evil habit. I loved shopping in the 1980s. I would mostly shop for CDs or clothes. Whenever a good album would come out, I just had to get it as if I don’t get it now, I never will. Having superb audio and video equipment was nice. 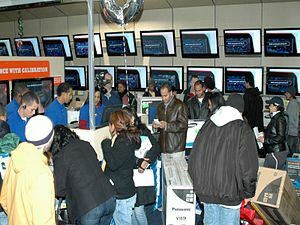 I would go into Best Buy and other electronic shops, even when I didn’t need anything urgently. When shopping for clothes I would look through any store that I could get to conveniently by bus such as Woolworths, Target, K-mart, Sears, JC Penney’s, etc. I would go through racks of shirts, pants, or jackets imagining that having these clothes would make me a much happier person. None of these things really changed me whatsoever. Finally, with my urge to shop came the denial of potential financial trouble. I figured since I had a steady job and have always made my payments in the past, there’s no reason why I shouldn’t be able to pay my bills on time in the future. Wrong! Now I say that going into debt is like consuming too much alcohol. You never see it coming, but eventually builds up whether you feel it or not. The next thing you know, you’re totally out of control. Myth 1: I must shop to be happy. Maybe you were just happy to get out of the house. Driving around your community and investigating any changes was interested you. Walking down the halls of the mall just to see what stores were currently there. Observing the holiday decorations and being a part of the atmosphere. Finding great deals on things you want. Comparing different brands of the type of item you’re looking for. Expecting good deals on days like Black Friday or the day after Christmas. Sorting through racks of clothes and finding some you really like. Discovering products that you didn’t know existed. Watching other shoppers to see what they’ll do. Coming home late in the day with the great feeling that you really accomplished something. Opening your newfound treasures and using them right away. Past joyful experiences encourage shoppers to shop even more in the future. You never have to leave your home. You need not have to bring your children along or find a sitter for them. You can find the best deal by browsing several retailers sites-all in a matter of minutes. You can read reviews on various products before making a purchase. The feeling of satisfaction you get once you’ve placed your order. You can anticipate the arrival of your new product soon. If you spend a great deal of time on the internet, most likely, you have certain sites that you love to buy from. From sites as Amazon and eBay, you anticipate great deals and can find almost anything under the sun without going from store to store. At the same time, you can shop for items you cannot afford now, but expect to in the future. Even if you only shop online, you still can be a compulsive shopper, especially if past online shopping results were fantastic ones. It can be habit forming all the same and some do it continuously because they always have. Online shoppers are no different when it comes to their wants and needs and the feeling of accomplishment they get from shopping. Myth 2: Shopping will make my life more pleasurable. Shopping brings on a temporary state of bliss. By having many of the newest and niftiest gadgets around, your home life is likely to be a happier one. For example, you have a stereo where you can plug an iPod into, a Karaoke machine, an Xbox 360, and perhaps some dazzling new lamps to brighten up the living room. Now your household is a much more pleasant atmosphere and it will be from now on. It’s now a dream-come-true or a story that ends with the line “and they lived happily ever after.” The truth is, that one day the thrill of these new household additions will be gone, perhaps long before the bills are paid. Myth 3: Shopping might improve my social life. So maybe you want to make your home more cheerful and charming so when people come over, they’ll truly enjoy themselves too. Maybe by updating your wardrobe, you’ll give your coworkers and friends a better impression of you. And if you’re into the latest movies, books, or music, you’ll have something to talk about at work. For example, a woman can browse through a rack of “cocktail dresses” and be amazed at how nice some of them are. She will then get the strong urge to buy a few as she envisions herself going to parties or on cruises while wearing them. The truth is, if she rarely if ever goes out, her fantasies will never come true. These dresses won’t magically make that happen. Deep inside, you may have this urge to “keep up with the Jones” to convince family members or friends that you are just like them and once they see that, you’ll win their approval. The real truth lies not in what you have but who you are. If you feel you don’t fit in with society as well as you’d like to, having a lot of the latest things won’t make any difference. Myth 4: Shopping can make me a better person. Most, if not all of us, would like to take on a new hobby, learn a new skill, or become more educated about a particular subject. These days, there are lots of books, videos, and kits that encourage learning or developing skills. All of these products come in shiny, new boxes with fancy, eye-catching artwork on the covers as a means of convincing shoppers that using their product is easy, fun, and will promise them instant success. All you need to do is follow their simple instructions and “presto”, you are now an expert at whatever it is the manufacturers or publishers aim to teach. For example, a woman sees a new food processor and believes she could cook like a chef with this new utensil. If she always wanted a food processor, such a purchase would most likely benefit her. On the other hand, if she never used one before nor ever needed one, this appliance will collect dust in her cupboard. Another example may be a man who stumbles upon an iPad while shopping at an electronic store. Though he never had the use for one, he can’t pass up this irresistible deal. Maybe it could help him keep up to date with the newest gadgets on the market or make browsing online handy when he’s not at his computer. Yet another example may be a mother who wants to teach her children more about animals, so she buys them educational videos on these subjects. If her kids lose interest, these videos will add to the closet clutter. Don’t get me wrong, there are a lot of great do-it-yourself tools and media packages out there, but they won’t change your life. Only you can do that. Doing so means dedicating long, hard hours with a great amount of perspiration, but even then, there’s no guarantee that this product will be a total success. Not too many people realize this and therefore lose interest in them fast. Sooner or later, these once glittering, shiny products end up sitting on closet shelves losing their luster and collecting dust. Exercise equipment is another great example, especially if these contraptions can be handily stored under beds. Myth 5: I only want a few more things and I’ll be totally satisfied. I’ve told myself that over and over again over the years, but something seems to keep coming up that makes me want to purchase something else. Maybe it’s a new MP3 player, a particular shirt, a new computer printer, or what have you. You’re thoroughly convinced that you need absolutely need this thing NOW or you won’t be totally satisfied. Next thing you know, you’re out shopping for it and stumble upon other dazzling things on the way. Sometimes it’s best to creatively make do with what you have rather than opt for the next best thing. However, if you should buy this “thingy”, whatever it is, your need has been sated but soon you might realize you didn’t really need it after all. Maybe it isn’t quite what you expected but you feel you have no legitimate reason to return it. Next thing you realize, your budget is running low and you regret making that extra purchase. Now what? If only you held off a little longer, you could have gotten it when you could really afford it. Remember, more than likely this extra thing you need will still be there a month or a year from now. You can always get it then. The main reason you get the daily paper is to see the ads. You shop frequently on lunch breaks. You’re never satisfied, you always want something more. You turn to shopping because you’re bored or depressed and there’s nothing else to do. Keeping up with the latest styles in anything is of utmost importance. You love to impress others by showing them things you’ve recently purchased. You arrange time to browse through stores while running errands. You continuously observe what others have and become envious of them. You’re not totally happy about your life and dream a lot about the type of person you’d like to be, or the lifestyle you like to live. You measure your self-worth on what kind of possessions you have and judge others by things they own. You continuously compare yourself to others. Making the most of the holidays is extremely important to you. Just to get the best deals, you’re willing to wake up as early as 5:00 am. Standing in long lines for something doesn’t bother you. If you must camp outside a store, you will. Collecting complete sets of things is a big priority for you. Your house is so cluttered it’s hard to walk around. Clipping coupons and comparing prices in flyers seems to be a bigger priority to you than anything else. Thank you for reading and I do appreciate your comments. If would like to leave me a comment, tell me what you liked or disliked about this article. If there’s something I left out or you disagree with, let me know.